Members of the phyllostomidae bat family have curious leaf-shaped noses like the one in the drawing below. 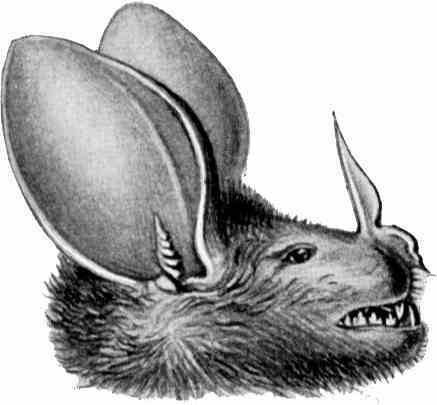 It's a Big Eared Woolly bat (Chrotopterus auritus) and the drawing's from Wikimedia Commons. This is one of the most diverse out of the 17 bat families and this variety can really be seen when you take a look at their different diets. Some feed mainly on fruit while others feed mostly on nectar, like the vulnerable, Western Nectar bat. Then we've got the members of phyllostomidae that feed on other animals, carnivorous bats like the Spectral Vampire Bat. Sounds rather supernatural and a touch creepy doesn't it? But really, it's just like any other carnivore that survives by eating other animals. Speaking of vampires, the three species of vampire bat are also part of this family. Unlike their fruit-eating (frugivorous) and carnivorous counterparts, who will eat other things such as insects and pollen, the vampire bat's diet is made up solely of blood. This family is also known as the New World nose-leafed bats and are found in South America, the Carribean and also in Central America. As to why they've got noses that are shaped like leaves, well the reason isn't known for sure. But the theory is that the shape makes their biosonar more accurate. If you haven't heard about this mind-boggling ability before, perhaps take a look at the echolocation page. Echolocating phyllostomidae bats do so through their noses but many species generate biosonar from their mouths. There aren't many bats that are white in colour but this family has one amongst its members. It's called the Honduran White bat and these animals make tents out of leaves and roost underneath them. The bats in this family don't get very large with the biggest having a body length of around 13 to 13.5 cm (just under 5 inches).